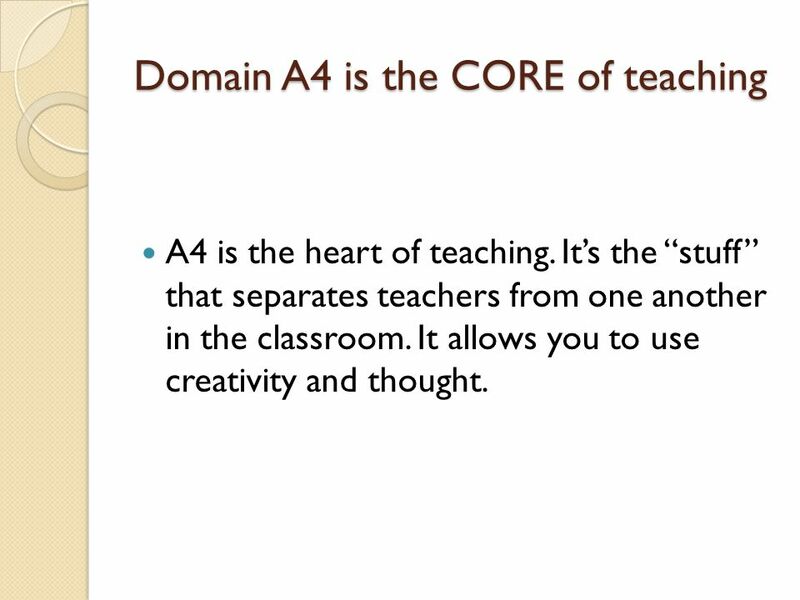 Domain A A4 Selecting Age-appropriate Teaching, Learning Activities, Instructional Materials and Resources that are aligned with the Goals and Objectives. 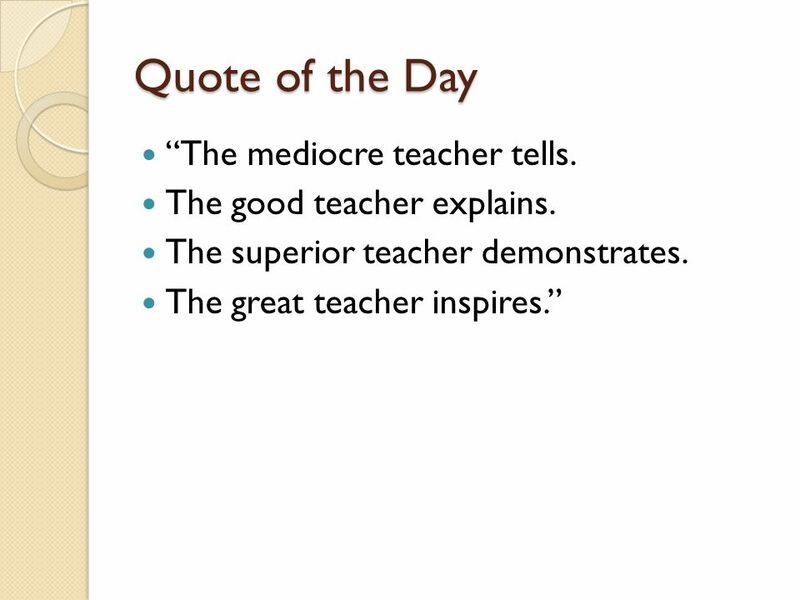 2 Quote of the Day “The mediocre teacher tells. A4 is the heart of teaching. It’s the “stuff” that separates teachers from one another in the classroom. It allows you to use creativity and thought. 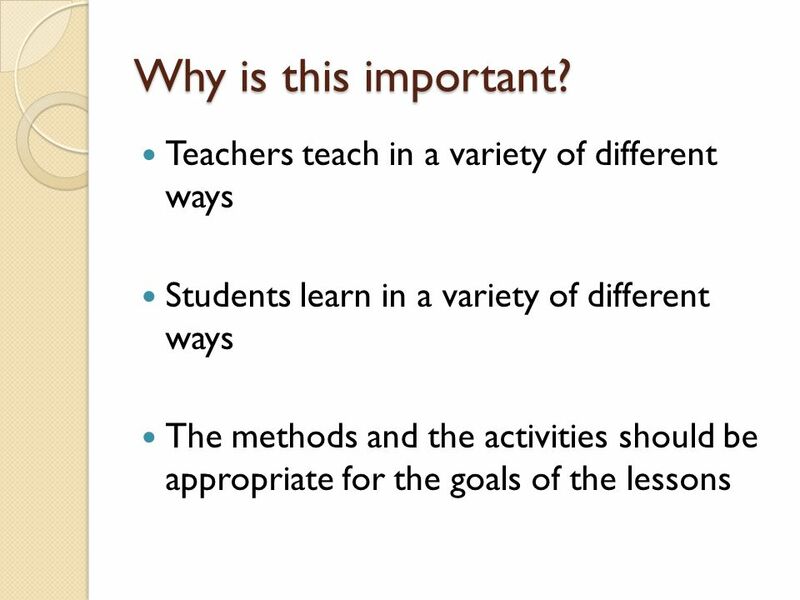 Methods are techniques the teacher uses to deliver lesson content to students. Activities include student actions that the teacher builds into a lesson in order to comprehend or master the content being taught. 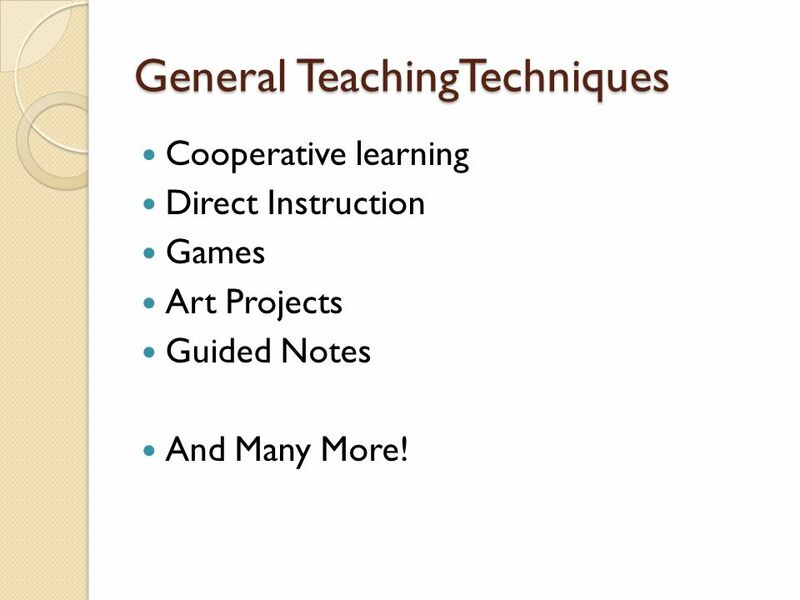 Cooperative learning Direct Instruction Games Art Projects Guided Notes And Many More! 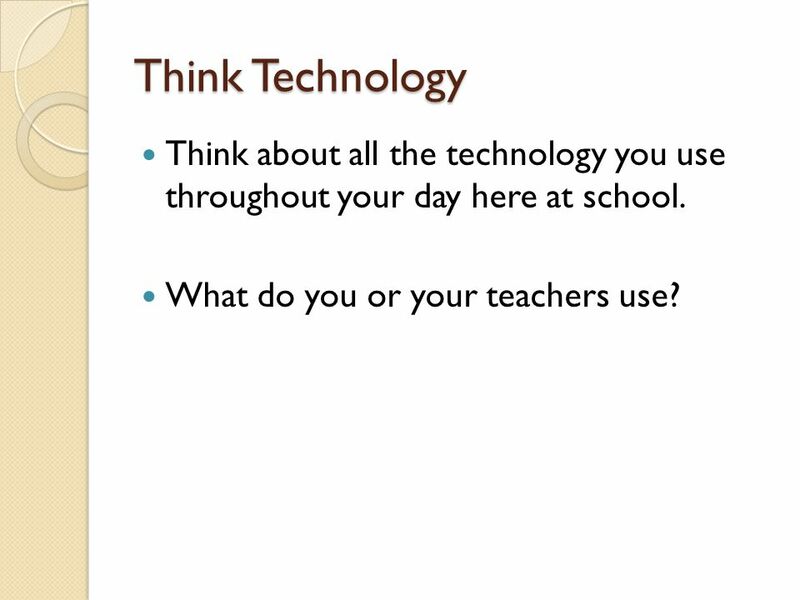 8 Think Technology Think about all the technology you use throughout your day here at school. What do you or your teachers use? Example: My 6th period class learns best through hands-on activities and projects, my 7th period class learns best by discussions and verbal directions. Example: Giving a written test in Braille for a students with a visual impairment. 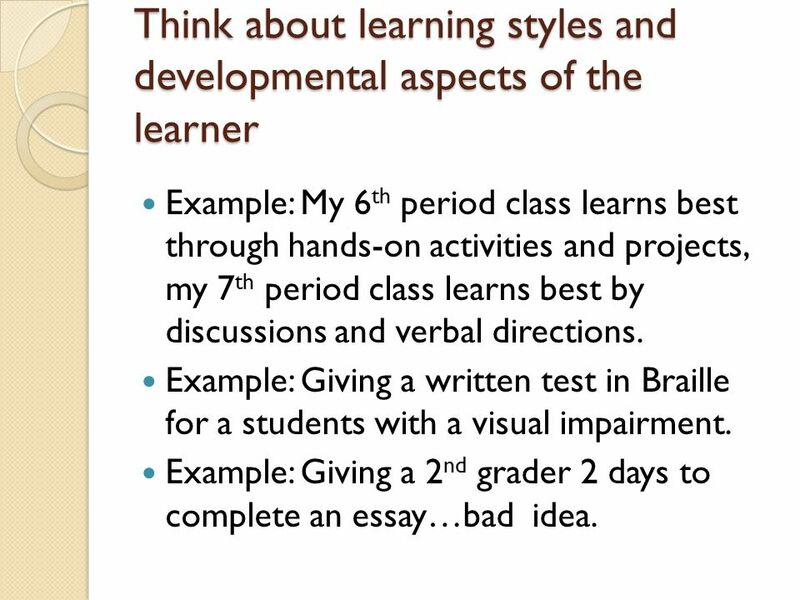 Example: Giving a 2nd grader 2 days to complete an essay…bad idea. 13 SURPRISE! To make sure you get the point of this Domain…. 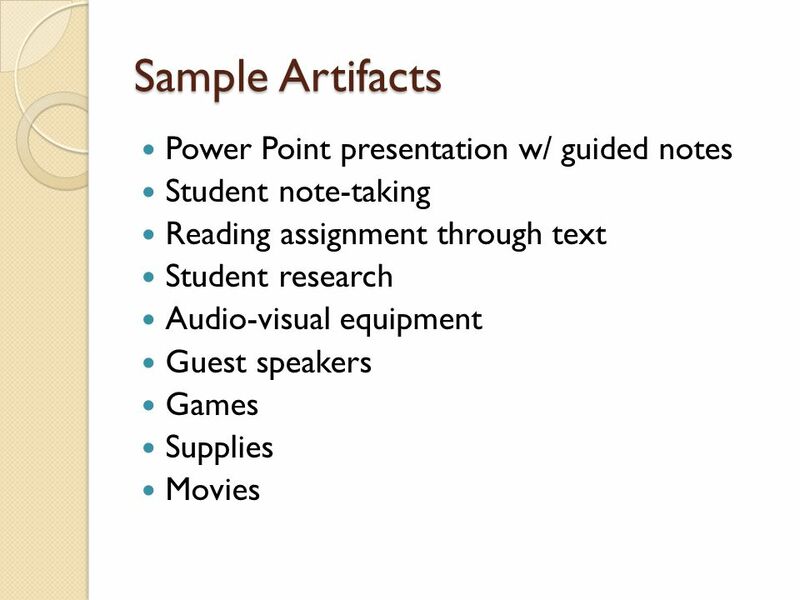 Download ppt "Domain A A4 Selecting Age-appropriate Teaching, Learning Activities, Instructional Materials and Resources that are aligned with the Goals and Objectives." 1 Daily Planning for Todays Classroom Dr. Mitchell Concepts taken from Daily Planning for Todays Classroom by Kay M. Price and Karna L. Nelson. 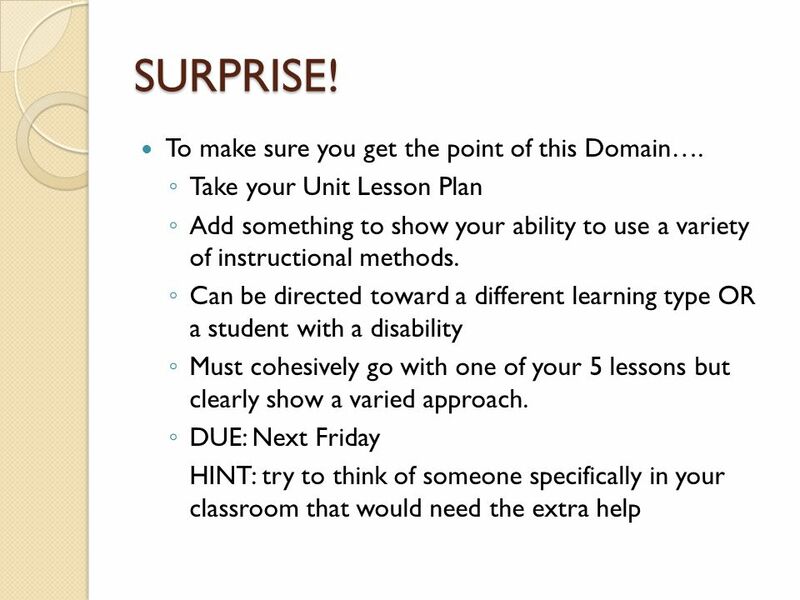 Domain A A5 Creating or selecting evaluation strategies that are appropriate for the students and that are aligned with the goals of the lesson. 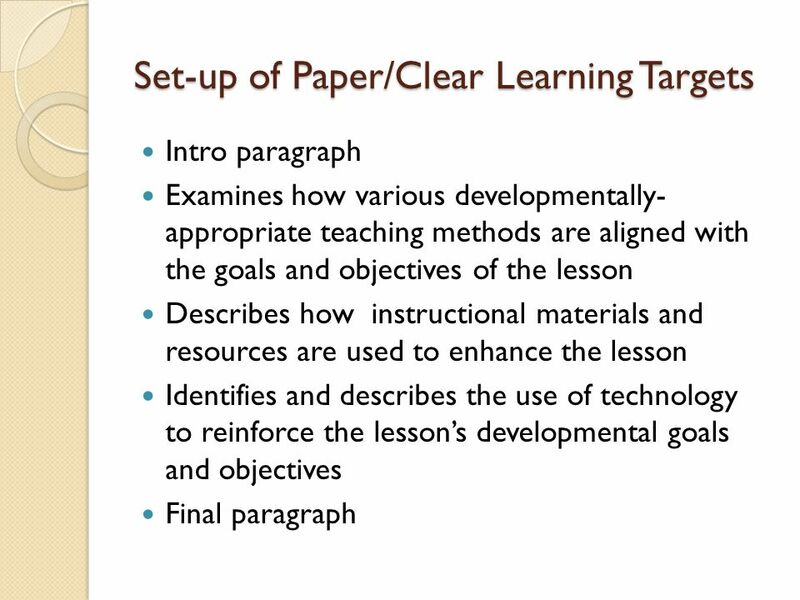 Articulating Clear Learning Goals for the Lesson that are Appropriate to the Students Domain A A2. Domain C4 Monitoring students’ understanding of content through a variety of means, providing feedback to students to assist learning, and adjusting learning. 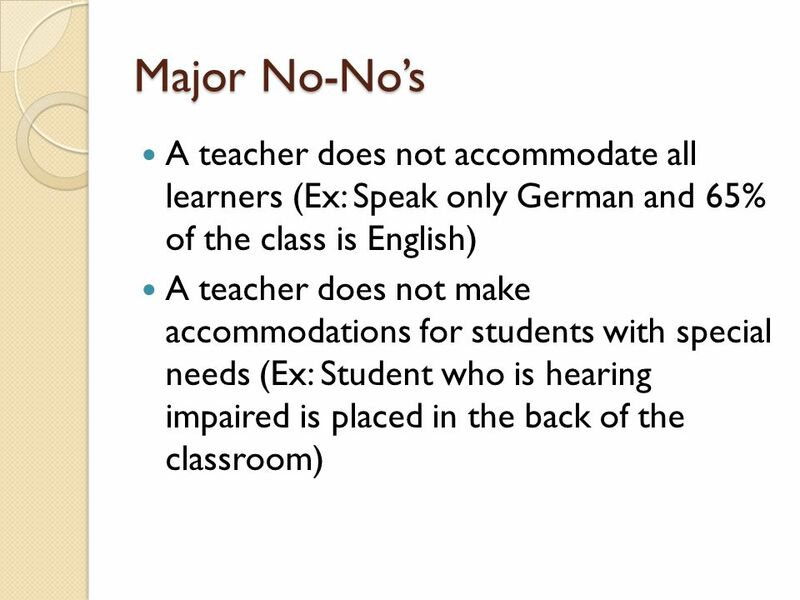 Teaching in Inclusive Classrooms Week 9. Check in Week for catching up On top of things? Justice Forum bubbl.us Quiz review Methods, Strategies and Techniques. Speeches. We are learning to: talk clearly about experiences, events, ideas and organising material effectively Link to the Learning Outcomes. 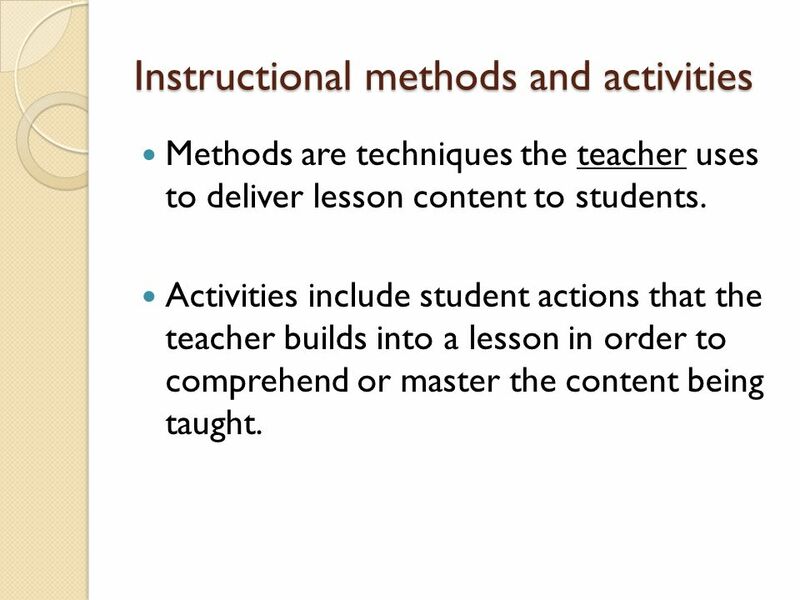 Instructional Strategies Instructional strategies – refer to the arrangement of the teacher, learner, and environment Many different types – we will explore. Goals for Art. Instruction Planning To teach students basic fundamentals of art and design. To supply students with a creative outlet where they can determine.  Rubric – Appendix pg. 26  Four components ◦ Planning – will look at tomorrow ◦ Classroom management ◦ Instruction ◦ Professional Notebook. Language Understanding to Improve Student Achievement Project LUISA Session 7. Mar 1, Welcome: Focusing on Assessment 2. Standardized Proficiency. Developing Metacognitive Skills in Your Students By Jane Sutton. Special Education Review & Update for Regular Educators. 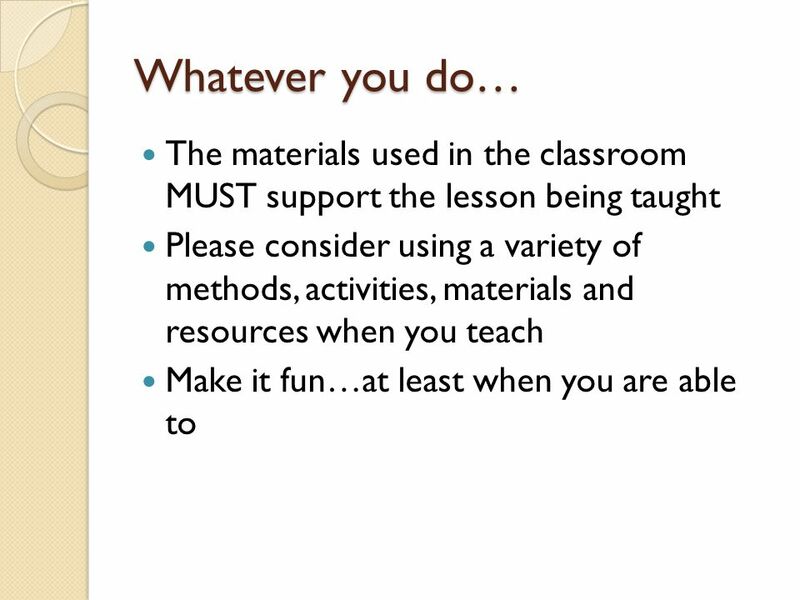 Debbie Poslosky Taken from the Common Core Standard Document. King’s Kids School English language teacher Ulziibayasgalan.U USING MINDMAPS IN TEACHING SCIENCE.